from this blog post, you are correct my friend! My friend Leslie has one of the cutest granddaughters ever and the other day Leslie's daughter kindly let me borrow her for a photo shoot. I recently had a bunch of my spring/summer patterns knit up in a 6 month size for my second trunk show. I'm so happy to have such an adorable model to show them off! one skein each of the Watermelon, Popsicle and Rootbeer colorways. This has been a very popular pattern this summer! I think that this little halter top looks especially adorable in the smaller sizes! Adelaide at first seemed very happy to put this outfit on. It was nice and comfortably cool on a very warm day. Perhaps she doesn't care for watermelons after all? Hmm... doesnt look like it.. 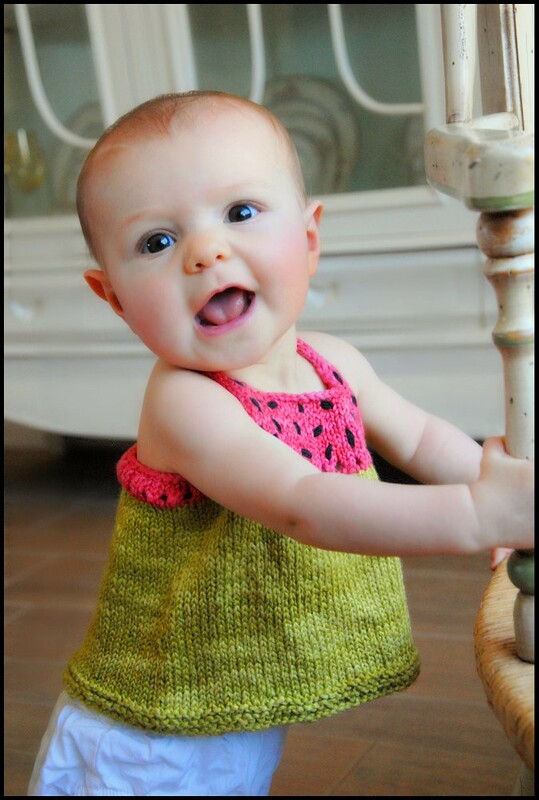 When we put the Watermelon sweater on her, we had a little "Watermelon Overload" incident on our hands. 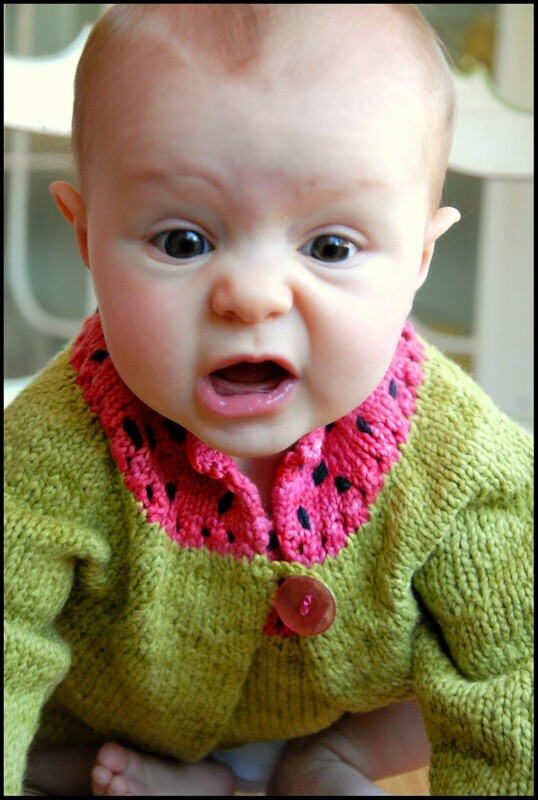 "Watermelons all over me! Ahhh!" Spring Garden Tee for me. 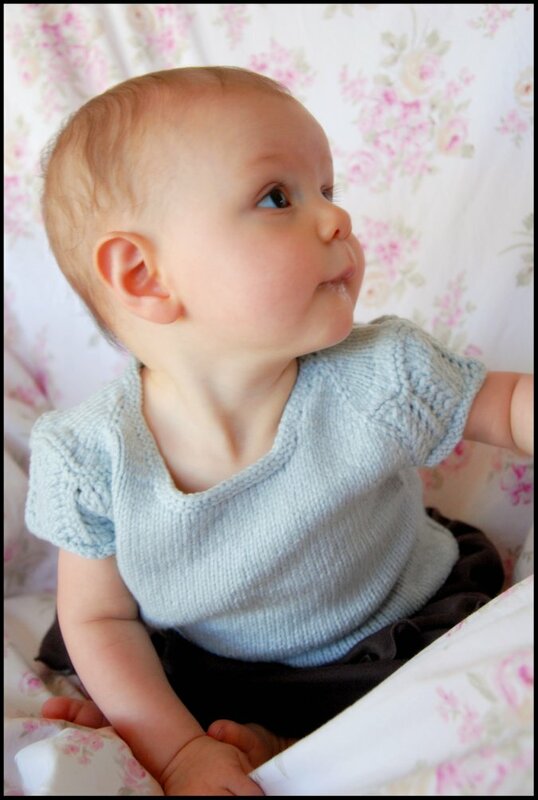 I found this beautiful soft blue (Rowan Calmer color #463) to be a wonderful color for her. 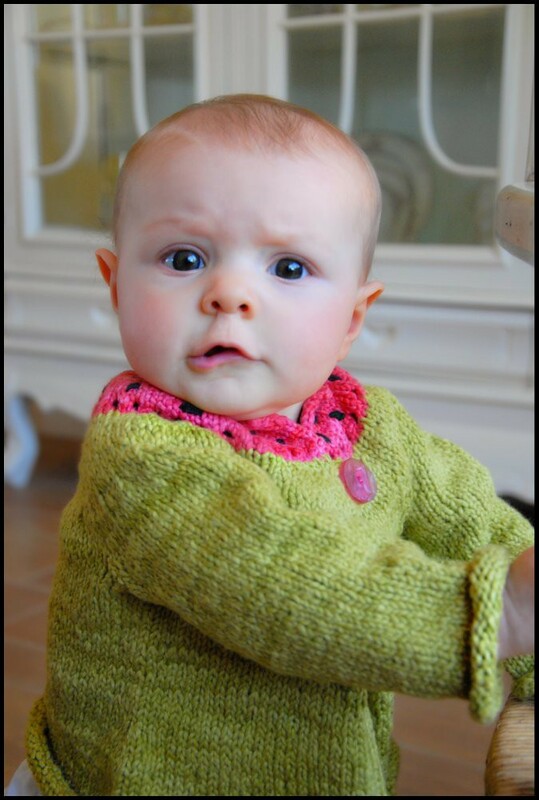 On my blog I recently shared pictures of this tee on an older girl, but its fun to see how it looks on a baby as well. It really is a versatile pattern! 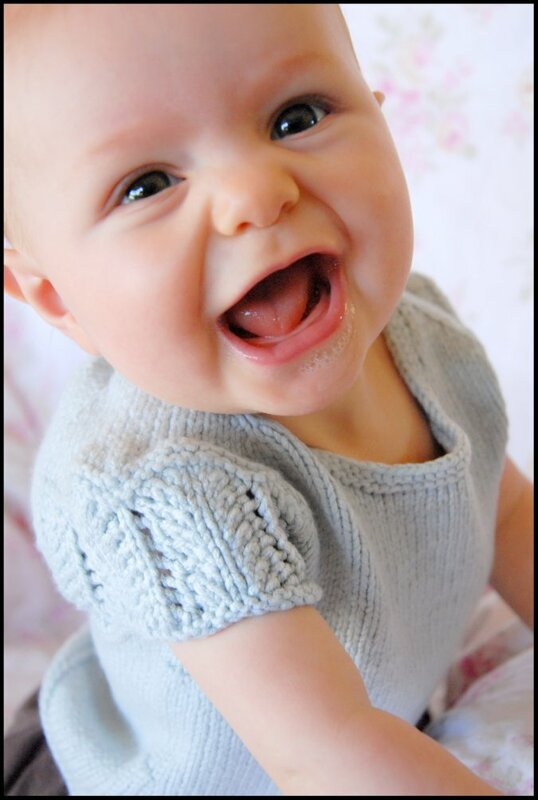 Thank you again to Adelaide and her Mom and Grandma for making this photo shoot possible. 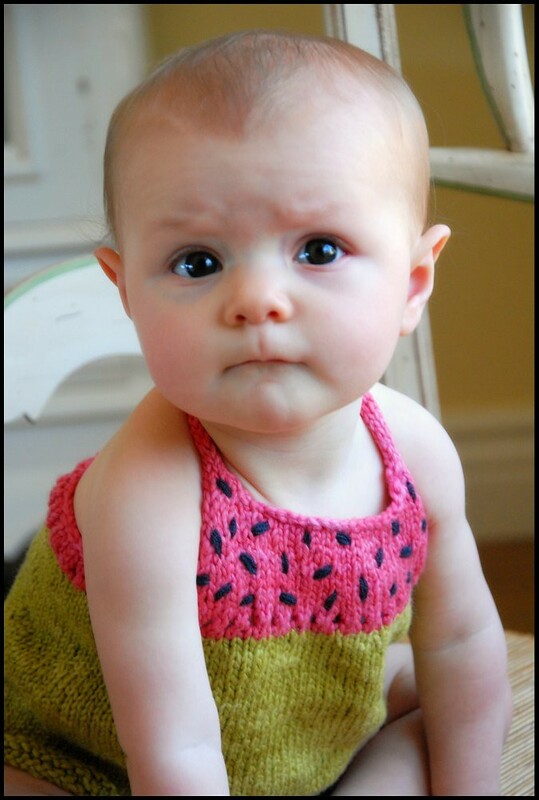 And don't worry Adelaide.. Ill keep that Watermelon sweater far far away.. It will never bother you again. 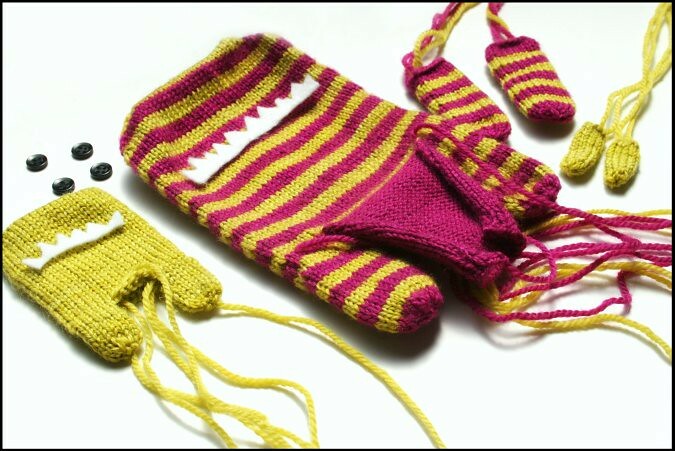 Thank you also to my fabulous sample knitters CeRae and Yaena. The garments turned out beautifully! If your local yarn shop is on my trunk show schedule, you'll get to see these beautiful samples in person. 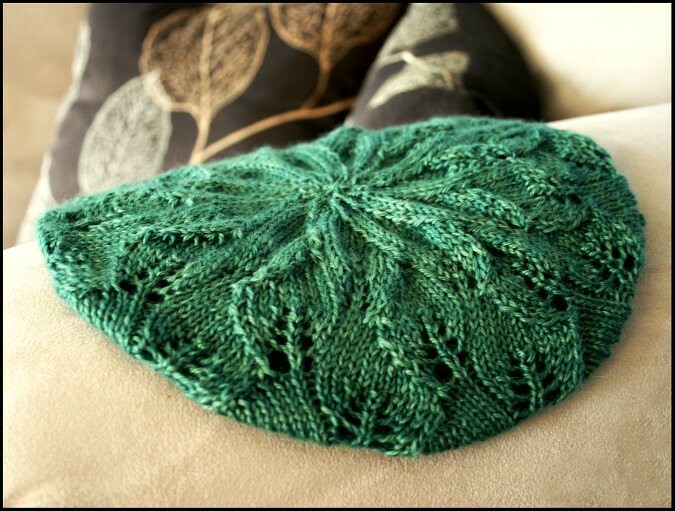 Recently I made this lovely hat for a knitting friend diagnosed with cancer. I'm very happy with how it turned out and I hope that she likes it too. Isn't it beautiful? All of those lacy leaves. I love it! I knitted this out of the yarn called for in the pattern, only one skein of Road to China Light from The Fibre Company. What lovely yarn this is. I highly recommend it! Check out my latest podcast episode for a review. 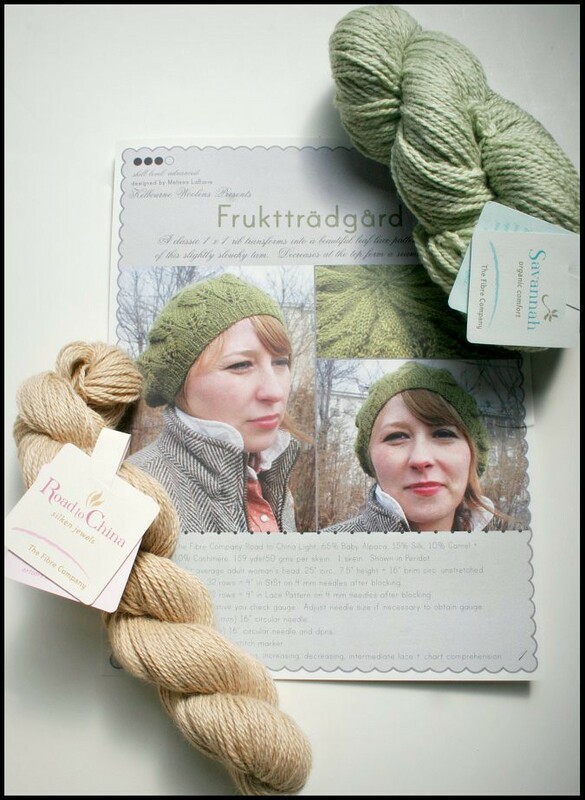 You will find the Frukktradgard pattern available here. The yarn is available here through the The Backwards Loop. of mine out of the Aquamarine colorway of Road to China. I'll be sharing pictures of that one soon! The Winner of Episode 38's Becoming Art drawing giveaway is JoannaCos! Congratulations! Click HERE to download Episode 39 MP3 file. It will be out tomorrow! Sorry! 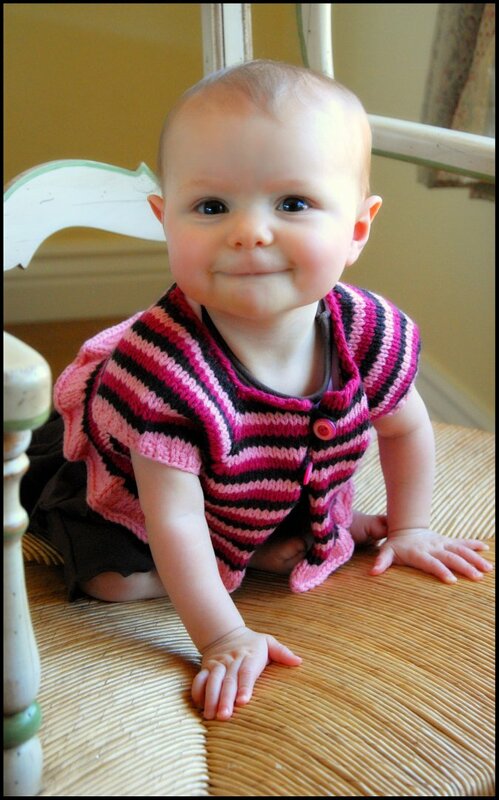 Can anyone guess which knitting pattern I just started for my daughter? Recently I've been going through a medical situation that has proved very taxing physically as well as emotionally. I am feeling much better now though. Thank you everyone for all of your kind notes and well wishes. 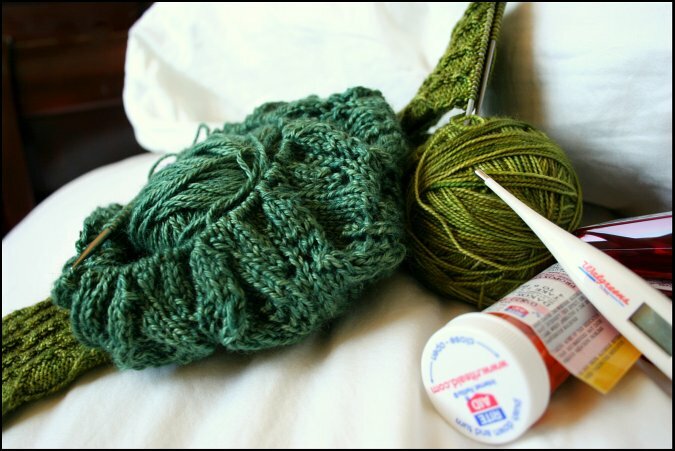 During this time I have found great comfort in my knitting. It has been such a nice distraction to focus on and relax with. I've picked up my Snicket socks again and am working on sock #2. 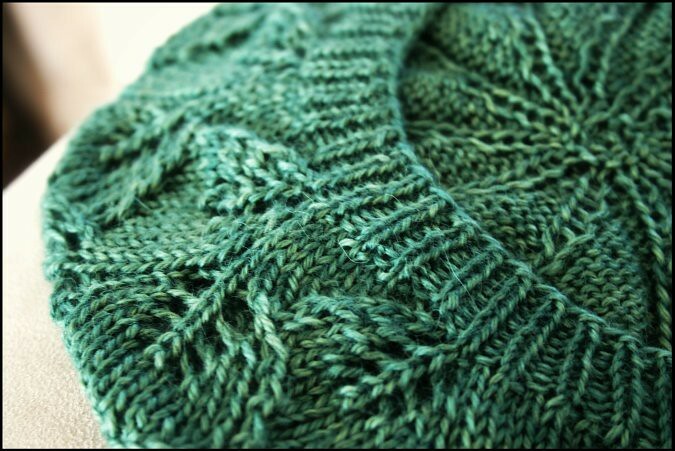 I've also started a beautiful new lacy leaf project in an unbelievable yarn that I will be reviewing in the next podcast episode. I've been dealing with some difficult medical situations lately, and I am using this time to recover.